It is a shuttle bus that links Paris Denfert-Rochereau station and Paris-Orly airport. It departs every 15 to 20 minutes more or less. Travel time: about 30 min. Stops: centre of Paris (Gare Montparnasse, Motte-Piquet, Eiffel Tower, Trocadéro, Etoile/Champs Elysées) and Paris-Orly airport. Opening hours: Daily, from 05:50 am to 23:30 pm (Terminal S) and 23:35 om (Terminal W). - Paris - Orly West, exit D, Arrivals level. - Paris Orly South, exit L, Arrivals level. Links Paris-Charles de Gaulle Airport and Paris-Orly Airport. Travel time: Between 70-80 minutes. A local bus that links Paris Porte de Choisy Station and Paris-Orly airport. Travel time: About 60 minutes. Frequency: Every 30 up to 40 minutes. Runs between Paris-Orly airport, various hotels and the Disneyland Resort Paris amusement park. Travel time: between 45-60 minutes, depending of the traffic jam. - Paris - Orly South: Bus station - Stop 4, Entrance C.
- Paris - Orly West: Arrival level - Stop 4, Entrance I. Provides service between Paris- Orly and Massy-TGV station. Travel time: about 30 minutes. - Weekdays: From 05:00 am to 09:00 am and from 05:00 pm to 09:00 pm (every 30 minutes). Outside these hours, every hour. Night bus services in Paris are offered by Noctilien company. - N22: runs to Place du Châtelet, in Paris, and gare de Juvisy. - N31: runs to Paris-Gare de Lyon. - N131 runs to Paris-Gare de Lyon and gare de Brétigny-sur-Orge. 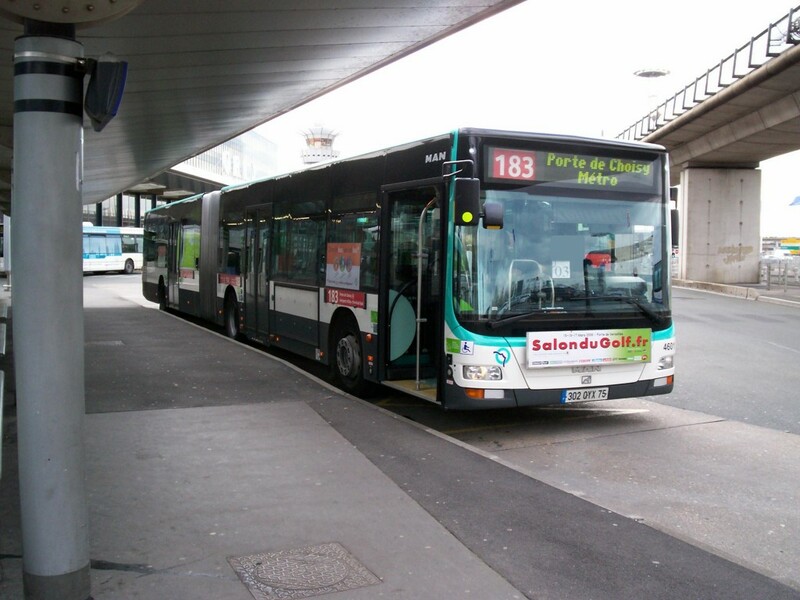 - N144: runs to gare de Paris-Est and gare de Corbeil-Essonnes. Orlybus and the local buses are part of the Paris travel network, run by Régie Autonome des Transports Parisiens (RATP). Le Bus Direct, the coach service of Air France, provides a link between five central Paris locations (Gare Montparnasse, La Motte-Picquet, Tour Eiffel, Trocadero and Étoile/Champs-Elysées) and the airport. Buses leave from S (south) terminal at entrance L and from W (west) terminal at entrance D. It takes 35 minutes and costs €12.